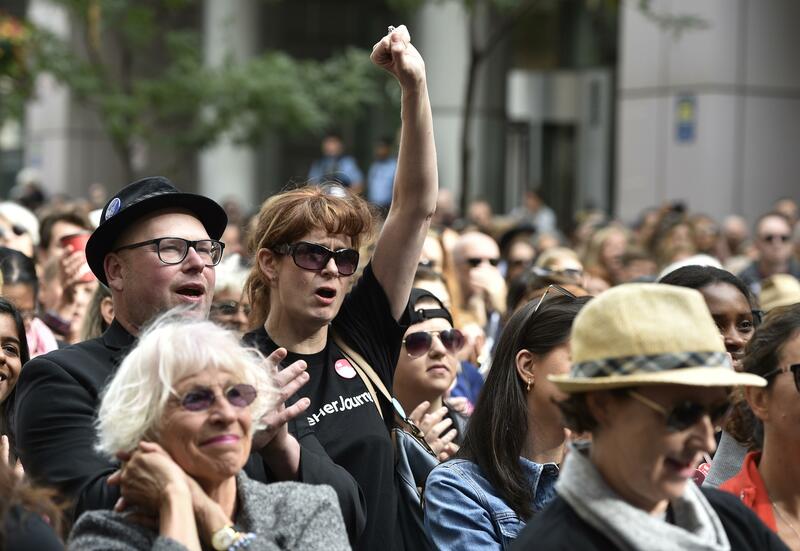 TORONTO – Women filmmakers, activists and actors congregated outside the hub of the Toronto International Film Festival on Saturday in a series of impassioned speeches on gender inequality in the movie industry and the power of female voices to overcome it. The “Share Her Journey Rally,” attended by hundreds on a chilly Toronto morning, followed similar events at earlier film festivals. Ahead of the gathering, Cameron Bailey, co-head of the Toronto Film Festival, signed an inclusivity pledge to achieve gender parity in the festival’s executive ranks and on its board of directors by 2020, a pledge that has been signed other festival leaders. Davis is also a producer on the documentary “This Changes Everything,” which premiered shortly after the rally on Saturday in Toronto. Directed by Tom Donahue (“Casting By”), it features Davis, Jessica Chastain, Shonda Rhimes, Meryl Streep, Rose McGowan and others discussing systematic sexism in Hollywood. “Progress will happen when men take a stand,” Streep says in the film. Saturday’s rally included tales of personal trials and triumphs, and statistics capturing the long-running disparity between men and women in front of and behind the camera. Stacy L. Smith, whose Inclusion Initiative at USC Annenberg School for Communication and Journalism has been at the forefront of studies focusing on Hollywood’s record of inclusivity, noted that from the top box-office films from 2007 to 2017 included only four films directed by black female filmmakers, two Asian female directors and one Latina director. “Now, other studios, call us and do the same thing,” said Smith. Keri Putnam, executive director of Sundance Institute, sought to dispel “the myth that there is a talent shortage” for women behind the camera, noting film schools are typically half women. Published: Sept. 8, 2018, 3:38 p.m.